Welcome to the First day of "Fall in Love with Your Home". 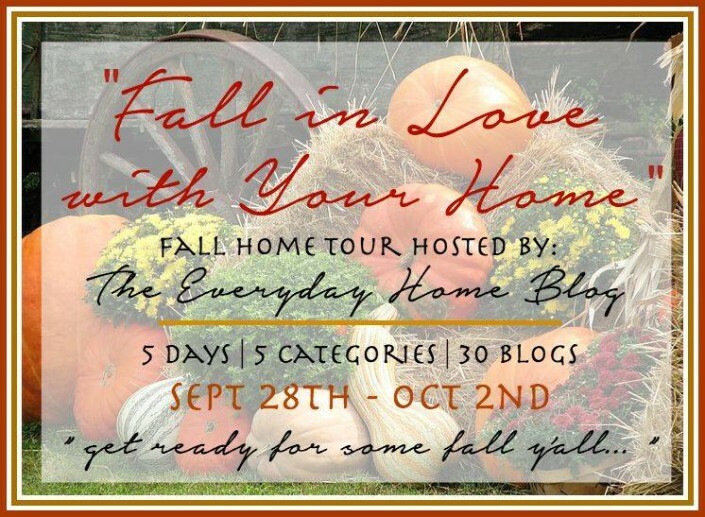 This is a blog tour that is filled with recipes, crafts projects, fall home decor, vignette decor and much more. This is a fun fill tour and with 30 bloggers participating, you are sure to be inspired. 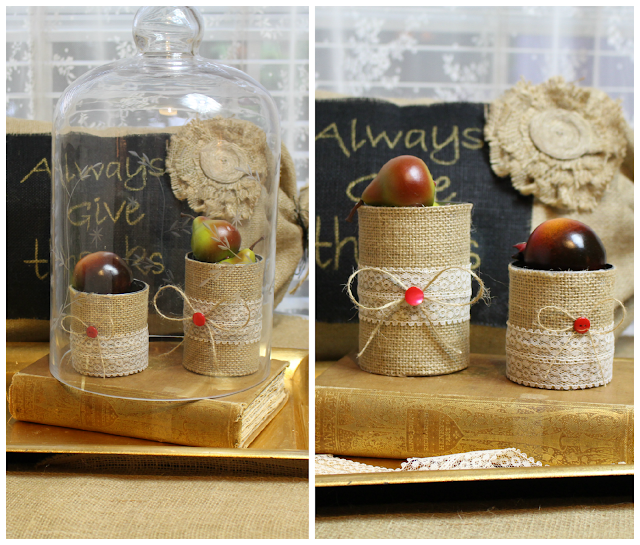 I love easy and simple fall decor that can be used up to Thanksgiving. Let's face it, who has hours upon end to redecorate for fall, Halloween and Thanksgiving. Its a lot of work that's for sure. I am going to show you an easy project you can add to your home and can be used till Thanksgiving. 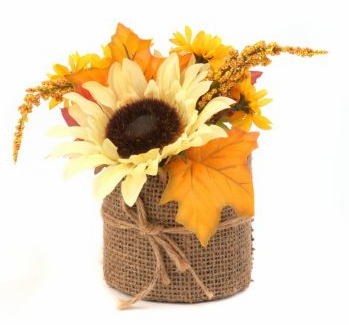 I was browsing through Kirkland's web site and I thought, I could make this myself with faux flowers. We all have tin cans in our home and I love the ides of using this for tablescape, bathrooms and really just about anywhere in your home. I love how so many companies are using tin cans and marking them up so much! We can make a set of three for a total of two dollars. This is Kirkland's tin can flower arrangement for $7. As you can see, all you need is some supplies. This is an easy project and you will never buy another tin can flower arrangement again. 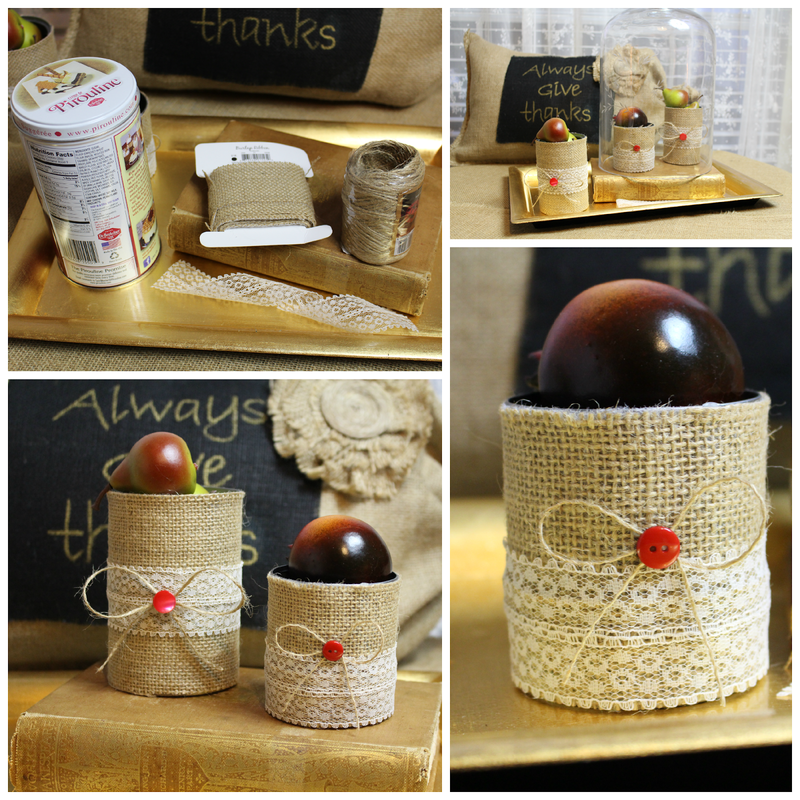 Take your burlap ribbon and add hot glue to the backside of the ribbon and place it on the can. Wrap the burlap ribbon around the can and along the way, add a dot of hot glue to keep the ribbon in place. Once you are done with the burlap ribbon, you can either leave it like that or add lace trim, button, gem any embellishment you have around the house. How about an old pair of earrings or brooch! Have you seen my burlap fall pillow? This is another easy project as well. I told you this was an easy project and I love how you can use these to hold flowers or fill with sand and add candles. Great for indoor or outdoor use as well. Thanks for stopping by and make sure to visit my other blogger friends. This is a great "knockoff"! I actually like it varying sizes you can do DIY. Thanks for sharing. I love it! So creative and perfect for fall! Oh, Vanessa! You did a fabulous job. Thank you for sharing your creativity. Excellent easy project--my favorite kind! Isn't it fun to create knock-offs? Great idea! Super cute, Vanessa! Love the added lace, much better than the Kirkland's! 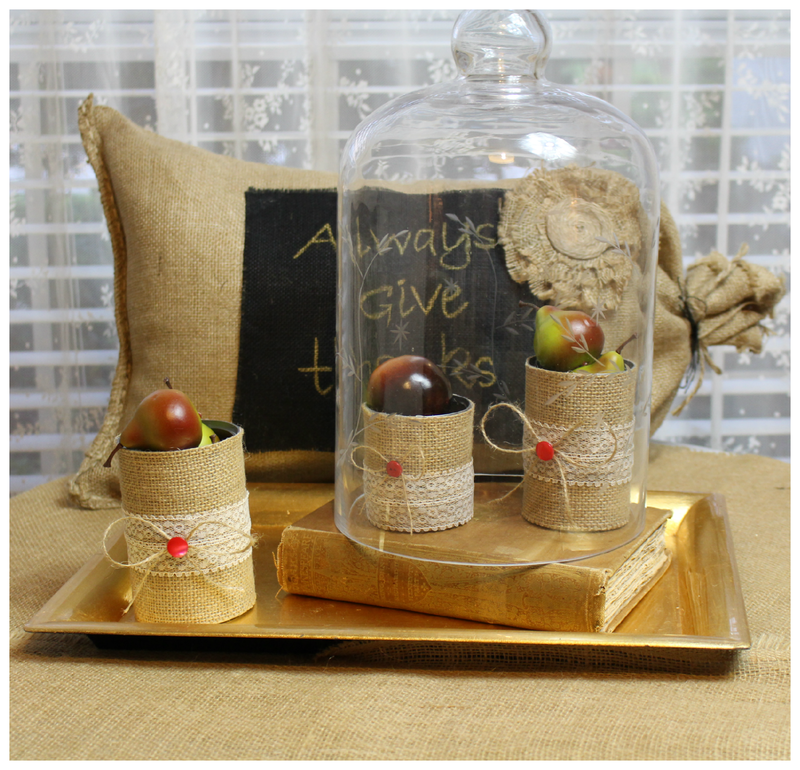 I love what you did with the cans and the burlap! I will have to make myself some of these! Thanks for sharing! Such an easy way to transform stuff. I love burlap I have to give this a try. I like yours better than the original Vanessa! Pretty! Great knock off...love how you filled them with apples so cute! Love your knock-off, Vanessa! Great job - and I love that you varied the sizes of your cans. Putting this on my to-do list!! I love the burlap pillow! Great tips! I love burlap in the fall! Easy & cute. What a great knockoff!